Niccolo Machiavelli, the first great political philosopher of the Renaissance, was born in Florence, Italy at a time when the country was in political upheaval. Since 1434 Florence was ruled by the wealthy Medici family. Their rule was temporarily interrupted by a reform movement, begun in 1494, in which the young Machiavelli became an important diplomat. When the Medici family regained power in 1512 with the help of Spanish troops, Machiavelli was tortured and removed from public life. For the next 10 years, he devoted himself to writing history, political philosophy, and even plays. He ultimately gained favor with the Medici family and was called back to public duty for the last two years of his life. 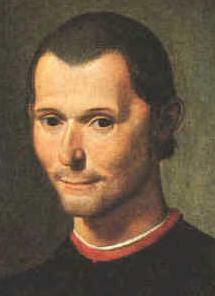 Machiavelli's greatest work, written in 1513 and published after his death in 1532, is The Prince, which stands apart from all other political writings of the period insofar as it focus on the practical problems a monarch faces in staying in power, rather than more speculative issues explaining the foundation of political authority. The work immediately provoked controversy and was soon condemned by Pope Clement VIII. Its main theme is that princes should retain absolute control of their territories, and they should use any means of expediency to accomplish this end. A discussion on the power of politics and who should hold that power.